Once or twice in a lifetime we are fortunate to find a new variety of potato that is truly extraordinary; so it is with Klondike Rose®. A beautiful rose-colored skin with an amazing gold-colored flesh and taste that is simply unbelievable! Combine this with a buttery texture so smooth and delicious that this is a truly remarkable potato. Consumers have received this delicious new variety with great enthusiasm. 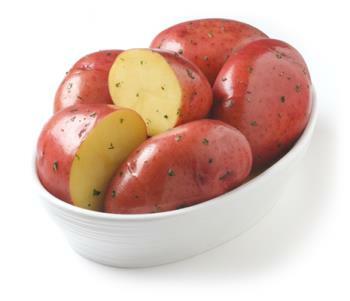 “I recently tried these Klondike Rose potatoes and they are FANTASTIC!” They taste great in any way you cook them!” Jack N. (Actual consumer).